North Santa Rosa County firefighter Adam Bondurant has never really heard a call for help. 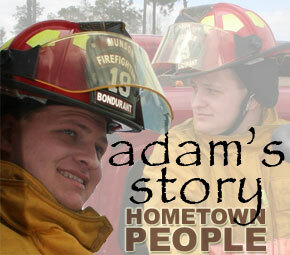 Deaf and a young man of few words, Adam has spoken volumes about being a volunteer firefighter and community service. “Grandpa, I’m going to be a firefighter like you when I grow up,” a young Adam would sign to his grandfather when the two would drive by the Munson VFD. 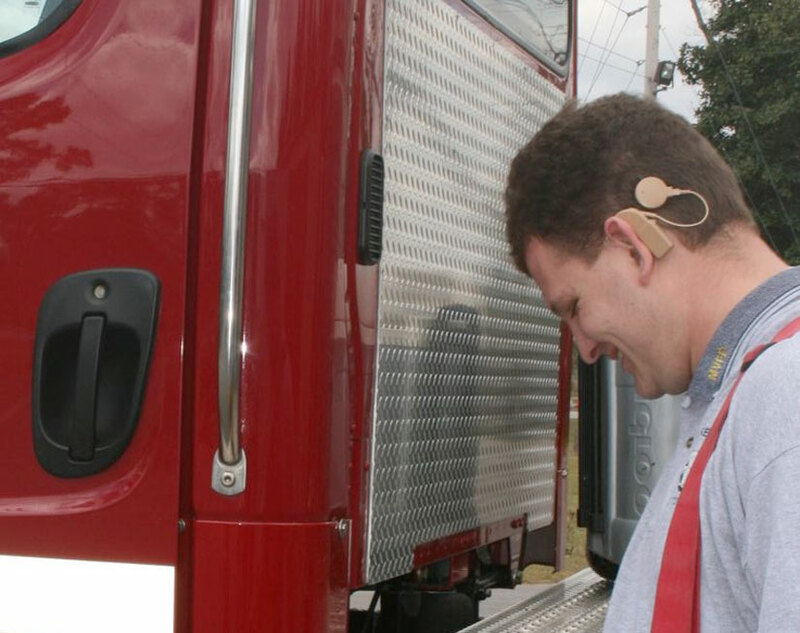 Adam was born deaf, so his firefighter dream seemed a bit unlikely. He spent much of his young life in and out of hospitals due to a rare medical condition. Adam’s family knew that his dream would never become a reality; his family was unsure if he would live into his teen years. But nobody told Adam. He wanted to be like his grandpa. Back in 1972, a fire destroyed Munson’s school. That’s when the community knew it was time for their own volunteer fire department. Albert “Sonny” VonAxelson Jr., who would serve 15 years working his way up to chief of the department, was Adam’s grandpa. VonAxelson and Tommy Grice were the two community leaders behind the formation of the Munson Volunteer Fire Department. “He has always talked about being a firefighter, and even though we have always pushed and encouraged him, I still keep a reality check on what Adam can actually do. I do not want Adam to ever be a burden or hindrance to anyone or any situation,” Adam’s mother Becky Bondurant said. At the age of 11, Adam was taken to New Orleans for a surgical procedure where he received a cochlear implant to possibly give him a small chance of hearing some sounds. As a teenager, his speech and vocabulary were limited. He spent all his younger years in private schools, as well as school speech therapy. He also spent many years in physical therapy. But all along, he still dreamed the dream of being a firefighter. “If we would have only known that the best therapy Adam could ever receive was one mile from home, life sure would have been easier for all of us,” said mom Becky. That therapy came from the fulfillment of a dream as Adam became a volunteer with the fire department. 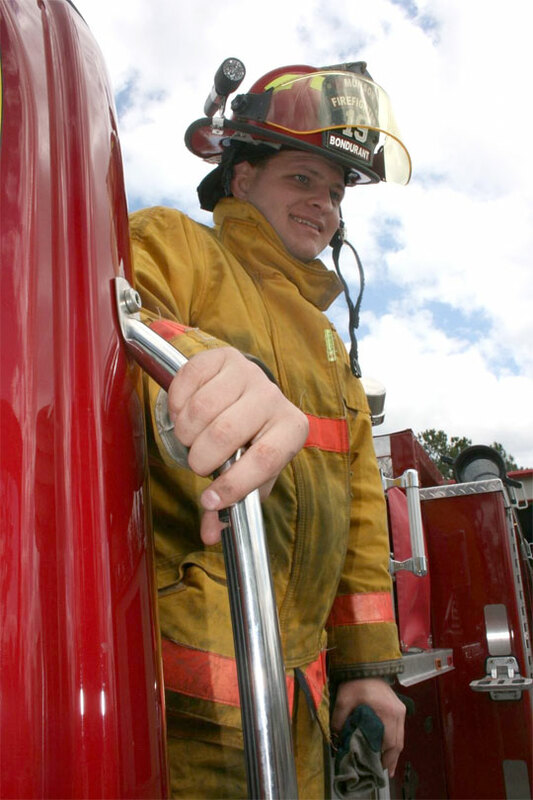 Adam Bondurant, 20, is one of only about 50 deaf certified firefighters in the United States. He recently obtained State of Florida Firefighter One Competency Certification, and he is currently enrolled in the EMT program at Pensacola Junior College. The lifelong resident of the north Santa Rosa County community of Munson has volunteered with the Munson VFD for about two years. But at the fire department, Adam is family. “He truly has a life of his own within the fire department. His speech and vocabulary has developed so much since he joined. It’s so amazing,” his mom said. In order to pass the firefighter certification, Adam had to participate in a live burn. He did not tell his mom when he was going so that she would not worry. Volunteer firemen are dispatched by pagers that provide information about emergency calls. Adam is unable to hear his pagers. He is able to feel them vibration when he is wearing them. At night, he sleeps with his pagers in the bed with him so he can feel the vibrations and answer calls. It’s hard to stop Adam. He hopes to one day work his way up to the assistant chief’s job once held by his grandfather. He hopes to obtain his Firefighter II and EMT certifications, allowing him to get a job as a paid firefighter. He is thinking about getting his paramedic degree. Adam truly has the heart of a volunteer fireman. On Valentine’s Day he heard a sound he had never heard before — the human heart. He had purchased a new set of stethoscopes designed for the hearing impaired. His heartbeat was the first that he had ever heard. “Every day that we spend with Adam is a learning experience. 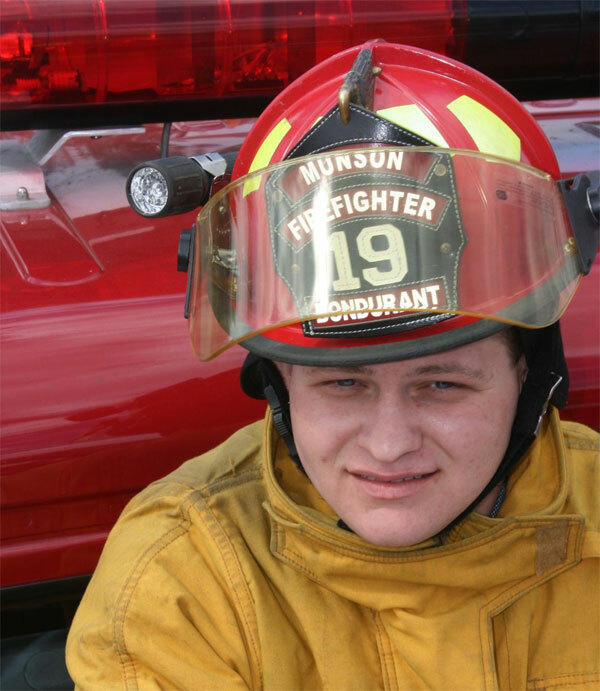 We as a department, are truly blessed to have him on our team,” Trish Baggett, a captain with the Munson VFD, said. “I have always dreamed of becoming a firefighter since I was a little boy, but people told me that I couldn’t be a firefighter due to my deafness. I hope that I have proven myself. It has been a challenge, but I hope I have earned the respect of others,” Adam said. “After that statement, I realized that it was us, not Adam, who was handicapped,” Baggett said. Trish Baggett contributed to this story. Pictured above and below: Firefighter Adam Bondurant, one of the few deaf certified firefighters in America. Submitted photos by Trish Baggett exclusively for NorthEscambia.com, click to enlarge. I would like to say congratulations on everything you have accomplished. You are an inspiration to everyone. You have already conquered the hardest obstacle, you chose to serve. I am certain you can obtain any certification you set your sights on. I wish you the best of luck on everything you set out to achieve in life and hope you never deapart from the fire service. Good job Adam. You have proved that deaf people can do anything that hearing people can do–except hear. My sister is deaf and she has pointed out many times to me that maybe we hearing people are the handicapped ones. Don’t ever give up on your dreams. You will be in my thoughts and prayers. The article was sent to me by a dear friend and I wanted you to know that we (Crestview Taxi) support you. I know the challenges that face the hearing impaired and I have to give you the utmost respect. Kudos to you Adam, Crestview Taxi is proud to have on it’s staff a sign language speaking owner. We appreciate what you are doing and support you in your ongoing endevors. Your story has inspired me!! You see.. my father has been a volunteer firefighter for over 30 years and he has gone from captain to chief. I basically grew up near the fire dept in a small town. ( Western PA) I have been deaf since birth. I’ve been dreaming about becoming a firefighter since I was a little girl. I have also told it is ” impossible” for me to become a firefighter due to my deafness. My father never considered me as a disablity but a daughter who wants to become a firefighter. Not only because I wanted to follow my father’s steps, it is also because of my growing up seeing a lot of things happening at fire dept. I’ve always gone there to play the pool with my dad or friends. I rode fire truck for hundreds of times, I went with my father to fill up the water in fire truck, I rode in a car when myy father heard the fire calls, he would put up siren on and drive fast as he could to arrive at fire dept.. I’ve seen the firefighters gets dressed quick and jump on fire truck.. go , go, go!! I’ve gone to fire picnic, I’ve gone to fire parades, I’ve gone to fire dept carnivals, or even I would wait up late or wait for my dad to come home, I would ask him what happened.. He would tell me what those fire calls for. Sometimes, we have dispatcher at home and mom would listen and telling me what the calls for. ( car wreck, bush fire , house fire, etc) You name it.. You can see why I have always been dream about becoming a firefighter.. Anyway, I remembered my father tried to enter me as a ” jr. firefighter”. I was not allowed due to my deafness. At least my father had tried. ( in early 80’s) However, he took me to ” fire drills”, He took me to a special training how to deal in very complicate and dark in house.. I’ve wore fire clothes with oxygen behind my back and it seem forever when I was in a amaze and dark basement, I came out of that basement and sweat like a pig!! I’ve learned a lot. Now, I am 36 years old and mother of 2 small children.. I would still dream of becoming a firefighter but I had to give up my dreams to take care of my children.. at least maybe at this moment.. I wanted you to read this article.. http://www.pittsburghlive.com/x/pittsburghtrib/s_609817.html This deaf man recently become a fire chief!! He and his wife had worked for my old school ( Western PA School for the Deaf) This story might help your dream to become a chief.. Go for it, Adam!! You have showed your Proof to Hearing world that Deaf people can do, not what we cant do because of our Deafness. STOP AUDISM. You already prove them what you are and what you are made of as “I CAN” be anything we want to be and you became as fireman. I know you are the first Deaf Fireman. I do not know who is the first Deaf Fireman. if you know who is the first Deaf Fireman. Please let me know. thanks.. Keep your Dream alive forever. Way to go Adam. I love the story and your determination. Keep up the good work. I am proud of you . My father was fire chief of Falmouth, Mass. Also His Uncles were firement, too. respect for other people. I’m really proud of this achievement in your life! Adam., Saw you on the news last night, Great Story. Keep up the good work! Way to go Adam! I saw your story on the news and was very proud of you. Adam is a “Gift from God”. Most people his age would have just given up. I respect and admire Adam’s determination and courage. I know whatever he sets his mind to he will be an achiever. My mother loved Adam and ask about him all the time. She was the School Secretary at Central. What a lucky person some young lady will be to have him someday. Good job Adam, we love you. As a cochlear implant recipient also I can truly empathize with what it takes to get you this far. I’m not sure if your implants are bi-lateral but if not the go for it and get your second side done. Two implants make almost the same difference as one implant alone did. Best regards and good skills for your future career. As a Career fireman, go get it buddy. When some one has a dream you go for it, even if you say to yourself from time to time you want to give up. The sky is the limit abd a trye inspiration to all who have to climb a mountain of doubt to do what they love. Saw the story on Channel 3 tonight. 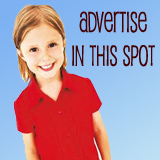 Too bad they had to steal another northescambia.com story. They stole that penny war story last night. good job adam. we are all proud of you. GOD bless you and your family. What a great story, I wish Adam the best in his career as a firefighter. So proud to be able to call you family – it is awesome what you have been able to accomplish. Wish you the best in everything that you dream for yourself and don’t let anybody tell you that you can’t do something. Adam this is a great story about you. I do not know you, but you sound like one of a kind. ADAM!!! You are awesome! I am so proud of you and I consider it a true honor to be able to call you my friend. Thank you for the time you give and for the good heart that you share with us all. Adam is truly a blessing to us. He is a young man who gives his best no matter what the task. He definitely is an achiever. Never give him a job to do unless you are serious about it being done precisely each and every time. Adam makes each of us a little better by keeping up with him. Many people have helped Adam along the way. He did not attend private school. He was educated in the Santa Rosa School district and had help from many dedicated educators along the way. He did spend many years in private speech therapy. We thank God every day that we were given Adam and the resources to help him conquer the world. way to go adam go for the fire chief job and keep up the good work!!!! Way to go Adam. I always knew you would accomplish ANYTHING you put your mind to. You are a special young man and you hold a very special place in my heart. I was blessed to have the opportunity to teach you and you remain one of those who inspires me daily. And to the author of this article—Adam attending SRC public schools from the age of 2 (Berryhill Elementary, speech therapy). Berryhill Elementary K-5, Munson 6, and then Central HIgh 7-12. He was never a loner, very much the opposite. People flock to Adam. He is an amazing individual who has overcome more adversity in his short life than most of us could ever imagine. As a Lt. with our fire dept, I think i can speak for all of us. WE ARE VERY PROUD AND LOVE YOU! you are like one of my own sons whom are also firefighters. Continue to grow and service your community. Expand your goals and you will go far. Love Munson Vol. Fire Dept. Your second family. Way to go Adam!!!! Keep up the good work and I agree with Henry, go for the Escambia County Fire Chief job. You can do anything you put your mind to, you have already shown us that. We all know it takes a certain type of person to become a firefighter and Adam you have it!!! Good luck in your EMT classes and your future endeavers. Munson is very lucky to have you on their “team”. Mom, you have done a great job! Thanks to everyone who wrote and took the photos for this story. It’s great. And to Adam: I am going to sure our all grandchildren read this story of your journey, and hope they will be inspired to go over, under or through obstacles as you do every day. It has inspired me, and given me an extra measure of strength for the day. If you read this story, you should leave a comment to encourage Adam. He’s way cool. We love yoU! As a Volunteer Firefighter, we are truly an amazing family. I’m glad you found your home with your family over at MVFD. 1 out of 50 that’s amazing! Reach for the sky and don’t look back, persue all you can be and I know someday you will be Assistant Chief just like your grandfather. thank you for this story. adam is amazing. if we all could works as hard as this guy we’d be ok.
Adam is a great man. I am glad to read his story. Hats off to you Adam. the escambia county fire chief job is open since perkins left. i nominate adam. Amazing story. Made me cry like a baby. Thank you Adam, and thank you to all the volunteers for your service. God Bless You.